All About Famous Memorials and Monuments of the U.S.
How do we remember important events? How can we best honor our dead? Should we pay tribute with realistic sculptures of our heroes? Or, will the monument be more meaningful and profound if we choose abstract forms? Sometimes the horror of events are too unreal to accurately represent. The design of a monument or memorial is often more symbolic than an accurate representation. Powerful Memorials in the U.S.
Vietnam Veterans Memorial, Jefferson Memorial, Washington Monument, Lincoln Memorial, and the National WWII Memorial in Washington, D.C.
Often the most powerful memorials — the monuments that stir strong emotion — are surrounded with controversy. The memorials and monuments listed here show various ways architects and designers have chosen to honor heroes, respond to tragedies, or commemorate important events. "The memorial is there to provide an experience," Michael Arad has said. That experience, no doubt, involves memory. It is no surprise that the word "memorial" comes from the Latin word memoria, meaning "memory." Architecture is memory. Memorials and monuments tell a story. How many buildings have you lived in? Where did you make your home when you were a child? when you first went to school? first fell in love? Our memories are inextricably tied with place. Events in our lives are permanently entangled with where they happened. Even when all the details may be fuzzy, the sense of place is forever with us. Architecture can be powerful markers of memories, so commanding that we sometimes consciously create memorials to honor and remember people and events. We may make a crude twig cross to commemorate a childhood pet. The carved stone on a family member's burial site is built to stand for centuries. Bronze plaques remind a nation of bravery in face of adversity. Concrete tombs can visually present the scope of tragedies. How do we use architecture to express loss and hope for renewal? Does it make sense to spend millions of dollars building September 11 memorials? How we spend our money is an ongoing debate for families, nations, and institutions. The earliest creations built by man for purposes other than shelter were spiritual in nature — monuments to higher powers and memorials to honor the dead. One thinks of the prehistoric Stonehenge in Britain and the Grecian Parthenon built in 432 B.C. for the goddess Athena. The first memorials may have been the great pyramids in Egypt, the tombs of the great kings and pharaohs. Historically, human beings remember events related to war. As tribal conflicts became wars between nation states, the victors have built monuments to their victories. Monuments designed as arches can be traced back to the triumphal arches of Rome, such as the Arch of Titus (A.D. 82) and the Arch of Constantine (A.D. 315). These Roman arches influenced 19th and 20th century war memorials around the world, including one of the most famous triumphal arches, the 1836 Arc de Triomphe in Paris, France. The 1842 Bunker Hill Memorial near Boston, Massachusetts memorializes the American Revolution and the battle that took place on this sacred ground. In the United States, battlegrounds themselves are often considered the memorial. Throughout American history, memorial architecture has been built both locally and nationally. American Civil War: Monuments to Civil War heroes continue to divide the nation. 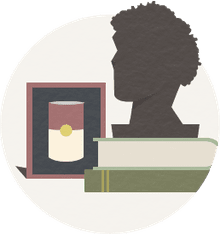 Communities and groups who had erected monuments to Confederate war heroes of the 19th century found these memorials being removed in the 21st century — remembering a culture of slavery and white supremacy became untolerable to a society struggling with inclusion. Architecture can stir emotions and controversy. Beneath this stone repose the bones of two thousand one hundred and eleven unknown soldiers gathered after the war from the fields of Bull Run, and the route to the Rappahanock, their remains could not be identified. But their names and deaths are recorded in the archives of their country, and its grateful citizens honor them as of their noble army of martyrs. May they rest in peace! September. A. D. 1866. World War I: A National World War I Memorial called The Weight of Sacrifice officially marks the 100th anniversary of the end of WWI as it is dedicated on November 11, 2018. The memorial design competition was won by the Chicago-based architect Joseph Weishaar and New York City sculptor Sabin Howard. The memorial in Washington, DC's Pershing Park is the first national monument to this war event. The 1926 Liberty Memorial in Kansas City, Missouri had been considered a "national" memorial because of the number of soldiers who passed through the city on their way to war. The District of Columbia War Memorial in Washington, D.C. is considered a local monument. World War II: Dedicated in 2004, the National World War II Memorial is located on the National Mall in Washington, D.C. Friedrich St.Florian, the Austrian-born architect, won the competition with his highly symbolic design. 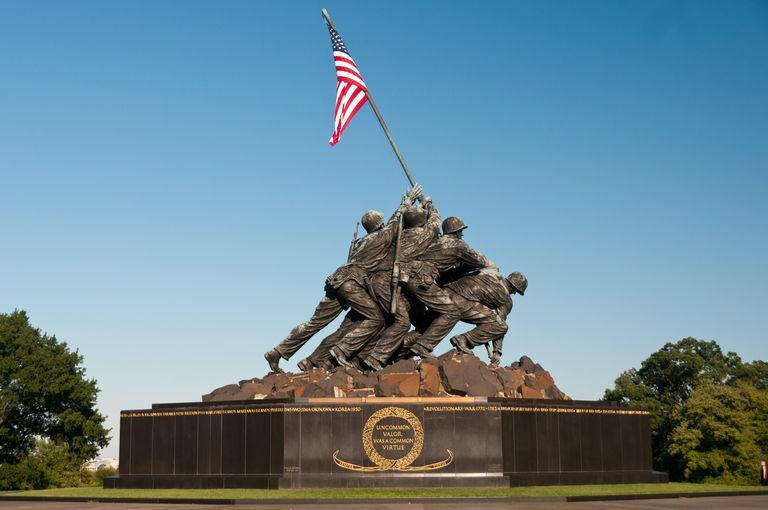 Down the road from St.Florian's memorial is the iconic Iwo Jima Memorial. Near Arlington National Cemetery, the statue replicates a dynamic photograph depicting an important event in WWII Pacific War history. The 1954 statue, however, is really called the United States Marine Corps War Memorial and is dedicated "to all Marines who have given their lives in defense of the United States since 1775." Similarly, the nearby 2006 United States Air Force Memorial and the 1987 United States Navy Memorial honor those military branches. The horrors of WWII may best be depicted at the U.S.S. Arizona Memorial at Pearl Harbor, Hawaii, a 1962 museum built over the hull of a sunken battleship. Keeping the ruins of war has been a popular way to impress memories of war on future generations. In Hiroshima, Japan the Atomic Bomb Dome, the remains of a building from the 1945 atomic bomb attack, is central to the Hiroshima Peace Memorial Park. Korean War: The Korean War Veterans Memorial in Washington, D.C. was dedicated July 27, 1995, decades after the 1953 armistice. Unlike other memorials, the Korean War Veterans Memorial honors the nearly six million Americans who served during the three-year conflict and not just the men and women who gave their lives. Vietnam War: The Vietnam Veterans Memorial Wall — the controversial design by architect Maya Lin — was dedicated in 1982 and remains one of the most visited sites in Washington, D.C. One of its most emotional appeals is the reflective nature of the engraved stone, where a viewer's image can literally be reflected while reflecting on the names of the dead and missing. A bronze statue of three soldiers was added in 1964 and the Vietnam Women's Memorial statue was added in 1993. Terrorism: A new type of war for the United States is undeclared, yet the horror of terrorism is everpresent. Michael Arad's vision for a National September 11 Memorial in New York City reflects the absence of what once existed — both buildings and people are to be remembered. In Shanksville, Pennsylvania, a 90-foot wind chime called the Tower of Voices houses 40 tonal tubes that sing together as the voices of the 40 passengers and crew of United Flight 93. September 11 memorials often use symbolism to honor place and people. The 1921 Tomb of the Unknowns, or the Tomb of the Unknown Soldiers, at Arlington National Cemetery is a simple white marble sarcophagus (coffin) that holds powerful symbolic meaning. Like the walls of the 1922 Lincoln Memorial, the Tomb of the Unknowns is constructed with bright white marble from the Yule Quarry in Colorado. Neoclassical pilasters, wreaths representing the major battles of World War I, and Grecian figures symbolizing Peace, Victory, and Valor decorate the marble panels. One panel is inscribed: HERE RESTS IN HONORED GLORY AN AMERICAN SOLDIER KNOWN BUT TO GOD. Although the Tomb of the Unknowns holds the remains of only a few individuals, the site honors the many unidentified men and women who gave their lives in armed conflict. The Tomb of the Unknowns also underscores America's commitment to account for all service members who are missing — an idea that gained prominence after the Civil War. Both the Tomb of the Unknowns and the earlier Civil War Unknowns Monument have been the focus of remembrance since the first Decoration Day, now called Memorial Day, when spring flowers are used to decorate the graves of fallen soldiers. Millions of people were killed between 1933 and 1945 in what is known as the Holocaust or Shoah. Remembering the horror of the slaughter is an attempt to never allow its repeat. Two of the best-known memorials are museums by two well-known architects. The Memorial to the Murdered Jews of Europe in Berlin, Germany, was designed by Peter Eisenman and the Yad Vashem Holocaust History Museum in Jerusalem is by Moshe Safdie. The United States Holocaust Memorial Museum in Washington, D.C. opened inn 1993 as a living memorial to the Holocaust. In Europe, artist Gunter Demnig has created Stolpersteine or "stumbling stones" to memorialize the last known addresss of victims. Architect Daniel Libeskind has created a Jewish Museum in Berlin, Germany and the Ohio Holocaust and Liberators Memorial in Columbus, Ohio. For some Holocaust survivors, remembering the horrors has been neither easy nor desireable. The history of the Holocaust Memorial in Miami Beach, Florida has its own story of objection and disapproval — yet the resulting sculpture garden is profound and moving. Until the 21st century, United States Presidents have been revered. One thinks of the great heads carved in stone at the Mount Rushmore National Memorial in the Black Hills of South Dakota. The Jefferson Memorial, Washington Monument, and Lincoln Memorial are three of the most well-known architecture destinations created for the public in all of Washington, D.C. In 1997, the Franklin Delano Roosevelt Memorial was added to the presidential mix in the nation's capital. The John Fitzgerald Kennedy Memorial by Pritzker Laureate Philip Johnson is located in Dallas, Texas — the site of the presidential assassination. Consensus is never unanimous for which U.S. Presidents deserve to be remembered. Agreement is even less harmonious for other leaders, groups, and movements. The Martin Luther King Jr. Memorial in Washington, D.C. is a case in point — bickering before and after it was dedicated in 2011. The Civil Right Memorial in Montgomery, Alabama, designed by Maya Lin, was dedicated in 1989 to far less controversy. National memorials and monuments to the plight of disenfranchised Americans — Native Americans, Black Americans, and LGBT Americans, for example — are few or nonexistant, except for museums. The design of monuments is often modelled after historic architecture of the past. For example, the iconic 1892 Washington Square Arch in New York City's Greenwich Village looks strikingly similar to the triumphal stone arches built since the Roman Arch of Titus from the year 82. Likewise, the 1910 Pilgrim Monument in Provincetown, Massachusetts was designed specifically after the 14th century Torre Del Mangia in Siena, Italy. Design is not materials, however, as the tower rising on Cape Cod is not Italian brick but made of granite from Maine — the tallest all-granite structure in the U.S. The St. Louis Gateway Arch is an homage to Westward Expansion. The Statue of Liberty National Monument is a monument to the ideals of freedom and opportunity. Nearby on Roosevelt Island in New York City, the Franklin D. Roosevelt Four Freedoms Park, designed by modernist architect Louis I. Kahn, is a memorial not only to FDR, but also to his vision of basic human rights. Sometimes we build memorials to remind us of what's important. How Have Architects Honored 9/11 Victims? FDR Memorial in Washington, D.C.
Who Designed the National WWII Memorial? Why Do We Celebrate Memorial Day?